Every farmer knows his field, crops, soil types, irrigation sectors and other fine details to properly manage tasks, people and resources. Even with this detailed knowledge, maps help us understand proportions, distances and relationships that can be difficult to convey otherwise. So since a few days now, we have added interactive maps on DropControl to browse and see the most important field information. 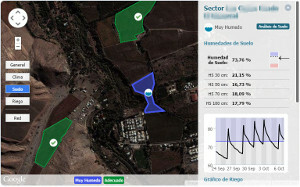 Now you can see the main features of the classic analysis tools from DropControl as map layers on the field’s dashboard. Use it to browse the same information in a more eloquent, graphical and easy way to communicate with others. If you want to enable the map to your field write to soporte@wiseconn.cl with a drawing or map file with the sectors named sa in your DropControl platform. Soil layer shows the graph of the last two weeks of the sum of all soil moistures at different depths in the sector (see image). The upper and lower thresholds are used to highlight the area on the map and set them as dry or very wet. This thresholds are set in Soil Analysis tool. General Layer shows all problems worthy of note of all other layers, easy to locate problems in seconds. Network layer can be enabled to view the status of the nodes and the gateway.